The Easter holiday involves many traditions. Of course, celebrating the religious holiday is at the top of the list, but for many people Easter is a holiday that involves bringing family and friends together and special — fashions whether your shopping for a new bonnet or taking advantage of shopping special holiday sales. Rebecca Lang cookbook author shared some timely recipes for making memorable meals for Easter. This talented mother of two also shares some money-saving fashion every mom will appreciate. About Rebecca Lang: She is a food writer, cooking instructor, and a ninth-generation Southerner. She is author of Quick-Fix Southern, Mary Mac’s Tea Room, and Southern Entertaining for a New Generation. She has appeared on Fox & Friends Weekend, WGN America’s Midday News, and numerous regional and local networks. Rebecca and her cooking have been featured in more than 50 nationally televised Southern Living food segments and in publications such as The Atlanta Journal-Constitution, The Washington Post, the Houston Chronicle, Wine Enthusiast, FoxNews.com, Glamour and Fitness magazines. She serves as a contributing editor for Southern Living and MyRecipes.com, teaches cooking classes across America, and writes a blog at rebeccalangcooks.com that has been featured on the James Beard Foundation Blog, Delights and Prejudices, and noted in Food News Journal’s Best of the Blogs. For Easter, my mom always bought us some new clothes. Especially for the little ones, it’s important to break out the cutest spring dress clothes. 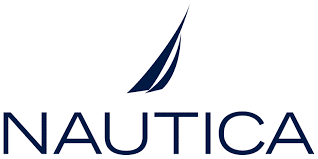 This Easter, Nautica has some great dress wear options for boys and girls, all available at Macy’s. Styles and sizes range from 2-7. They have an adorable pastel pair that would be great for a warm & sunny Easter for a little boy, we have a suit & tie set in khaki & peach, all sold together, and for the girl, she can complement him nicely in this pastel aqua polo dress. If temperatures drop slightly, there are some darker options, like this classic navy seersucker suit & bow tie set, all sold together, for the boy, and a chic navy polka dot dress for the girl, that is perfect to take them both from church to brunch. No Easter egg hunt is complete without the perfect basket. 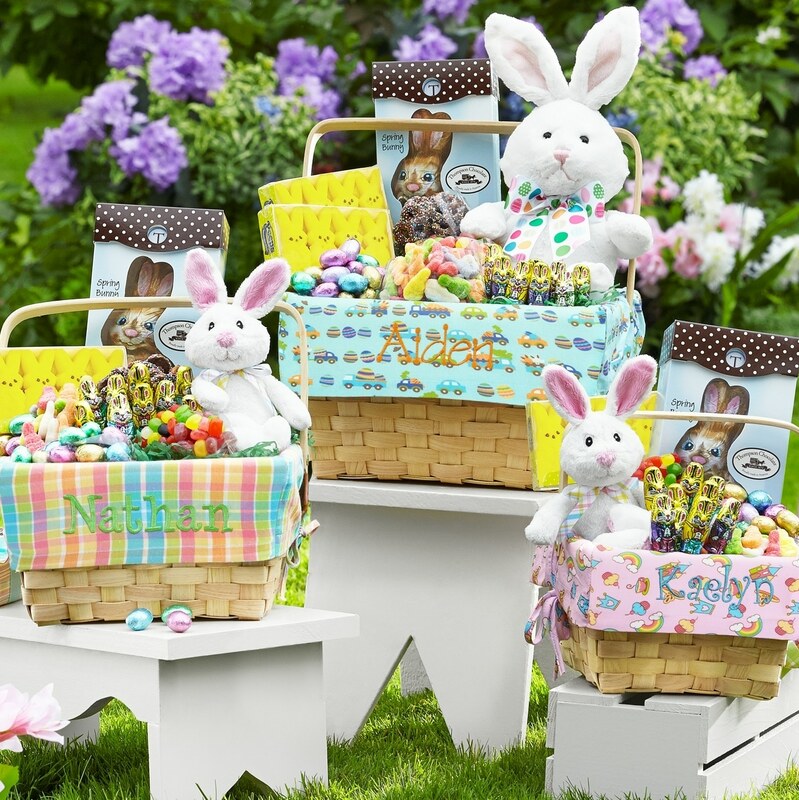 Send Easter smiles with these All-In-One Easter Baskets from Personal Creations, complete with candies, chocolate and a plush bunny. These are available in 3 different sizes with 8 different liner options and come with free personalization of any name. Retail on these baskets starts at $34.99 plus shipping and handling and they’re available at PersonalCreations.com. 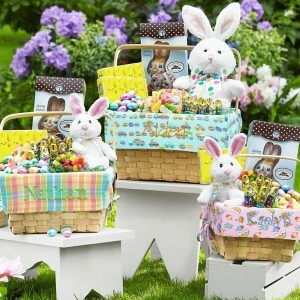 The Personal Creations site also offers other fun Easter gifts for the entire family along with Easter-themed home décor, all which can be personalized for a custom look and feel. Order soon though so it gets to you in time for Easter. 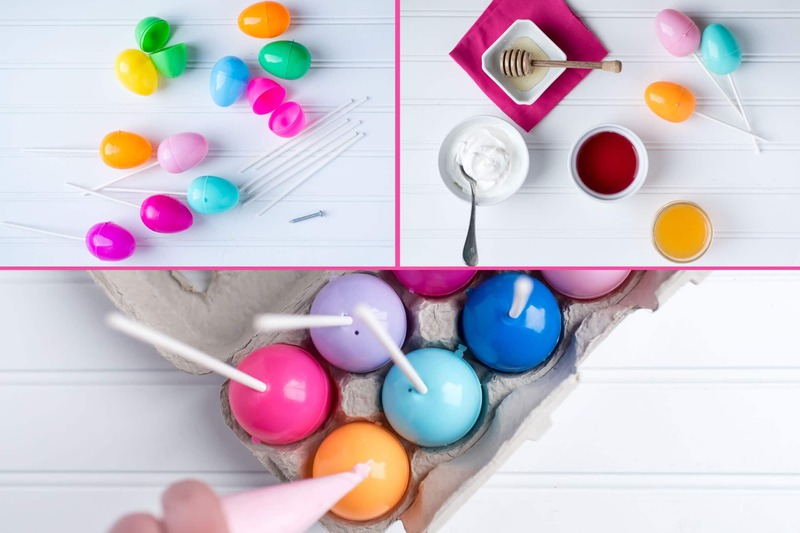 Personal Creations is also sharing some recipe inspiration for easy and adorable Easter treats you can make at home with the kids. Use a spanking-new nail (so it’s clean) to tap a hole through the bottom of your egg so you can insert a lollipop stick. You’ll need a second, smaller hole as a vent so you can fill them properly. Prepare five or six eggs at a time and then stand them in an egg carton — what else? — with the holes facing up. Easter can be a busy holiday, so instead of creating my own recipes on the larger dishes, I look for timesaving measures. My best tip for this Easter is having HoneyBaked Ham as my centerpiece. Your Easter table isn’t complete without it. It’s slow smoked for up to 24-hours, locking in flavor and making each ham moist and tender. In addition, each Honey Baked Ham and Turkey Breast is fully cooked and ready-to-serve, allowing you more time to celebrate this special occasion. Shari’s Berries Easter treats are the perfect gift to make Easter magical again. 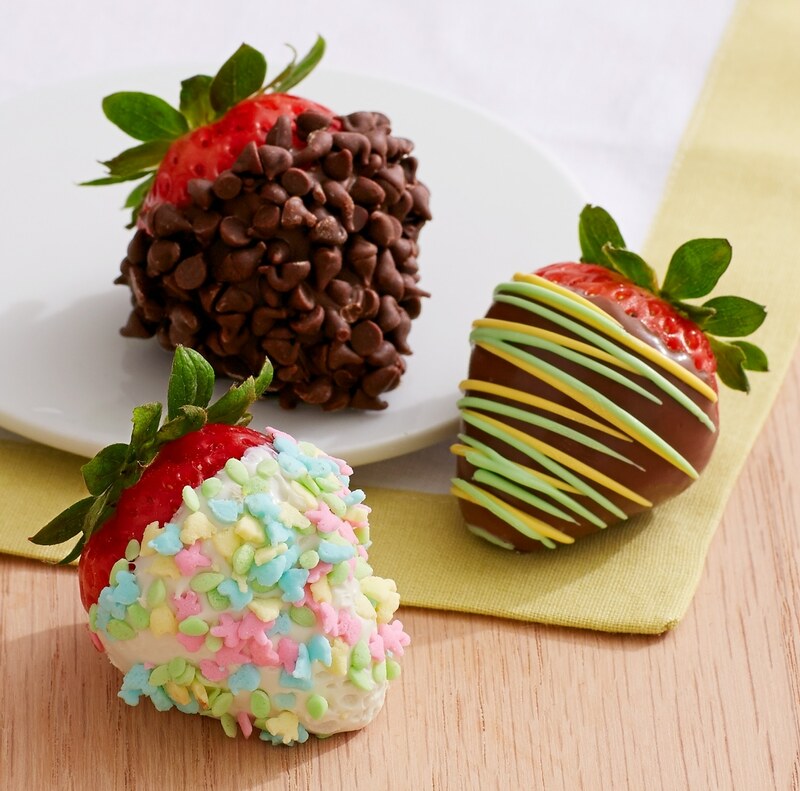 Shari’s Berries has a variety of fun Easter products, like Gourmet Dipped Easter Strawberries, adorable fudgy brownie pops shaped like chicks, bunnies and eggs, and hand-decorated mini Easter cookies. Items start at $29.99 plus shipping and handling and can be ordered at www.berries.com. Order soon so to get it in time for Easter. 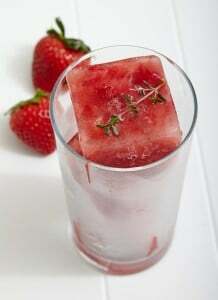 Shari’s Berries is also sharing a Strawberry Thyme Ice Cube recipe, perfect for grown-up Easter celebrations. Muddle strawberries with mortar and pestle. Distribute evenly so each section of the ice cube tray is filled 2/3 with muddled berries. Each cube requires 2-3 berries. Fill the rest of the way with water and then top with a sprig of fresh thyme. Freeze 4-5 hours. When you slide the ice cubes out of the tray, they’ll have a slight ombre look where you topped them off with water. Of course, you can tell everyone you did that on purpose, with your top-secret ombre ice cube technique.